Speaking during a meeting with compliance officers of different banks in Port Harcourt on Friday, April 5, 2019, the EFCC boss said fraudsters working in banks are helping politically exposed people to commit various financial crimes. 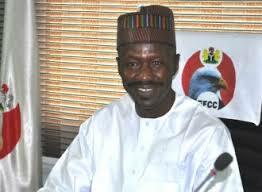 Apart from helping politicians to launder money, Magu said some bankers also help fraudsters in committing cybercrime. The EFCC boss identifies MoneyGram and Western Union as veritable platform internet fraudsters use to dispossess innocent people of their money. He said: “The banks also help the politically exposed persons to steal and launder public funds. You will also agree with me that the banks give lifelines to internet fraudsters; the one we call Yahoo boys. “They (banks) provide the market for them through MoneyGram and Western Union that are readily available. So, this is the reason we say we must come here. We have to talk. Unfortunately, we have fraudsters working in the banks; working right inside the banks. “Journalists are supposed to be corruption fighters and hunters just like the compliance officers; they are also corruption fighters and we must all work together to make the fight against corruption in Nigeria work. Magu also said that the EFCC has secured 194 convictions in the last three months, adding that some of the cases were not filed this year.